How many goodly creatures there are here! • Evolutionary risk factor #1: A narrow or orthodox business definition that limits the scope of innovation. Google's response: An expansive sense of purpose. • Evolutionary risk factor #2: A hierarchical organization that over-weights the views of those who have a stake in perpetuating the status quo. Google's response: An organization that is flat, transparent, and non-hierarchical. • Evolutionary risk factor #3: A tendency to overinvest in "what is" at the expense of "what could be." Google's response: A company-wide rule that allows developers to devote 20% of their time to any project they choose. • Evolutionary risk factor #4: Creeping mediocrity. Google's response: Keep the bozos out and reward people who make a difference. A key practice is the use of heterarchical (as opposed to heirarchical) organization forms which favor innovation -- particularly augmented by social software. Google is unique in that it is a large enterprise in hypergrowth that is new (an brave) enough to adopt new tools and practices. The absence of legacy can be enough of an advantage to create a legacy. Part of this is due to organizational forms such as heterarchy -- which are often confused with being fully democratic, meritocratic and sprinkled with granola. Lee Bryant picks up on as thread about the "ability to enjoy the benefits of open markets and free socieities is also a function of our position in the power structures at play, whether we like it or not." "In essence: stripping away formal and explicit rules from groups does not result in groups without power relations or hierachies. All it does is replace them with implicit, invisible and tacit forms of power relations - friendship networks, charisma, chat and all the other things which Californian Nietzscheans rather like." Will also relates this to Richard Sennett's idea that ���Power is present in the superficial scenes of teamwork, but authority is absent���. The Tyranny of Structurelessness was written in 1970, and since then there have been some cultural changes, but mostly technology advances that facilitate interaction. But nonetheless, it is important to regonize that even in the flattest organization, an order emerges that is not as ideal as some theories would hold, but one that is more adaptive. In this short piece they brilliantly show people operate with at least two core motivations – social and economic – and hence live in two different “markets” for all our actions. Social markets – when we are asked to do favors, or work for charity, or provide for love ones, are markets in which effort is independent of payment. If you give me a little gift or a large gift, my effort does not change. However, once you introduce a financial incentive in a social market, my effort (in their study) actually decreases, because I am now working for money – and my effort is linked to how much I get paid. If one continues to increase payment, one can get effort back to where it was when I was working for nothing! Put another way, a small payment is not only a bad incentive, it pollutes what otherwise was effort that did not have a price by turning a social market into a financial one. So in developing practices to tap into social incentives, use incentives that truly are social. What's really cool is that I think this opens up the possibility of Web 2.0 technology not only improving knowledge management and sharing processes, but it also has the ability to motivate people beyond their current levels of participation. Andrew McAfee, who kicked off this whole Enterprise 2.0 thing, considers these tools ratchet technologies and there's no going back. He picks up on this comment from Socialtext user Sean Park: I honestly can’t conceive of going back to working without the wiki. And for all intents and purposes, wide adoption only began 6-7 months ago! Ease of Use: To start editing a page on Socialtext, I double-click on the page. This is so convenient that I’ve set up a one person wiki (which must be a taboo of some kind) with my to-do lists on it. I can access it from anywhere, and add to it in seconds. With the del.icio.us browser toolbar I can bookmark a new page with one click, and go to my collected bookmarks with another. Usefulness: I’ve set up wikis for all of the collaborative projects I’m working on, and email alerts and/or RSS tell me when any of my colleagues have advanced the work. Del.icio.us frees me up from having to remember URLs or keep my bookmarks consistent across the computers I use, and its tagging feature lets me organize sites and pages the way I want to. The social features of del.icio.us are, for me, icing on the cake. I use them to learn about new sites and voices devoted to topics I’m interested in. This post ended up being a collection of really damn interesting stuff. But I guess should give it a conclusion. Here we have tools that, with the right practices, provide a deeper level of participation which themselves enable different organizational forms. Not all companies will apply these tools to flatten the organization, but there will be a trend towards transparent productivity that may never go away. In three years of running Socialtext, we have not had a single report of inappropriate use of these tools by an employee. Sure it can happen, but that does not discredit the data point, nor that you could infer from it that people are, on the whole, good. Mass adoption does not simply happen because of grassroots interest. But when it does, it explodes. At DrKW, wiki traffic outpaced the intranet in just six months. These are productivity tools. They are simply more efficient than the way intranets and email works in the enterprise today. Busy people like them. 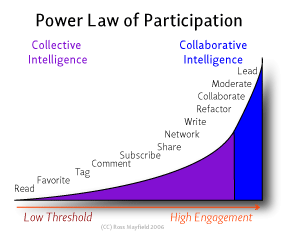 There is a Power Law of Participation. Not everyone has to be highly engaged, a very good thing. And a core community can take hold to do the heavy lifting. Do we really have to point out this is not KM? Perhaps most interesting, inherent transparency rewards sharing, punishes hoarding and fosters trust. Any adoption initative should seek out key contributors for what they can contribute. But one man's expert is another one's nimcompoop. At a certain point, the content generated stand on it's own. It is either a valuable resource worth returning to, or people will not. Arguing for quality or expertise makes sense in theory, but a little practice and understanding of wabi sabi provides greater understanding. Most of Chris Anderson's Long Tail examples have focused on models of consumption, not production, where intelligence is largely artificial. Amazonian algorythms guide users down the long tail from Britney Spears to Nobodys, made available without the constraints of shelf space. But the interesting question is will the tail wag? Can users discover their own power together to either discover something great, or even create it? As we engage with the web, we leave behind breadcrumbs of attention. Even when we Read, our patterns are picked up in referral logs (especially with expressly designed tools, like Measure Map), creating a feedback loop. But reading alone isn't enough to fulfill our innate desire to remix our media, consumption is active for consumers turned users. Digg is the archetype for low threshold participation. Simply Favorite something you find of interest, a one click action. You don't even have to log in to contribute value, you have Permission to Participate. Del.icio.us taps both personal and social incentives for participation through the low threshold activity of tagging. Remembering the URL is the hardest part, and you have to establish an identity in the system. Commenting requires such identity for sake of spam these days and is an under-developed area. Subscribing requires a commitement of sustained attention which greatly surpasses reading alone. Sharing is the principal activity in these communities, but much of it occurs out of band (email still lives). We Network not only to connect, but leverage the social network as a filter to fend off information overload. Some of us Write, as in blog, and some of us even have conversations. But these are all activities that can remain peripheral to community. To Refactor, Collaborate, Moderate and Lead requires a different level of engagement -- which makes up the core of a community. When users participate in high enagement activities, connecting with one another, a different kind of value is being created. But my core point isn't just the difference between these forms of group intelligence -- but actually how the co-exist in the best communities. In Wikipedia, 500 people, or 0.5% of users, account for 50% of the edits. This core community is actively dedicated to maintaining an open periphery. Part of what makes Flickr work isn't just excellence at low threshold engagement, but the ability to form groups. Participation in communities plots along a power law with a solid core/periphery model -- provided social software supports both low threshold participation and high engagement. Last night my character on World of Warcraft (a Paladin called Kalevipoeg), reached level 60 -- the highest in the game. So far, it's a "research" project gone awry, and something that explains why blogging dropped off over the last six months. When you start the game you believe it ends at 60, but it turns out there is much more (large scale raids, epic gear). The game, as designers intended, has become more interesting. Coordinating 40 people to take down a big bad guy, when some are strangers and all with different skills and capabilities, is a very different experience. But the most fascinating part of the game to me lately is what designers never intended. In WoW, you have to cooperate to advance. Most of the activity is in adhoc groups acheiving goals to receive loot, some of it very rare. So when a rare drop happens, norms that transcend the loot rules encoded. A manual dialog on who is a fit for the loot ensues, with ties broken by roll. Large scale raids have a handful of drops to divy up, so whole systems are invented by groups. With DKP points assigned by convention, a manual auction takes place that rewards participation over time. Users that break these rules are labeled Ninjas and face banishment from the guild. The gaming industry has realized the value of user generated features for some time now (AddOns, Level Editors, etc. ), but I find fascinating the areas designers choose not to code. For users, they are perhaps the most important, the Point of Reward, but they are left to their own devices. A large scale raid loot distribution system is not supported by their Auction House platform, but instead is left to users to create their own market through conversations. I still have issues with WoW's disconnection with real life, failure to augment it, let alone provide incentives to live it better. I believe it provides good simulation-based training, have made connections there as happens with all social software, but it still comes at a cost great enough that I am unsure of it's return. Ah, hell, it beats TV. This is pretty interesting, two independent wiki communities for travel, Wikitravel and World66, have been acquired by Internet Brands (best known for Cars Direct). They both reach 2 milion visitors a month and 10,000 editorial contributions per week. Internet Brands focuses on large ticket purchases, and with the level of engagement a wiki community has, it makes sense. Wikitravel is CC licensed, so the community has some say, and it will be interesting to see their reaction. Terms of the deal are not disclosed, but if you find them you could add them to this wiki page. But picture this post with a discoverable watermark that bakes in these two terms, with a CPM of $10 communicated to the clearinghouse each time the invisible .gif is impressed. Say you read it and like it, fair reader and writer, and decide to republish it on your site. Someone else grabs it from my blogs and remixes it into a commercially minded remix. Now picture someone finds it on your site, and thinks it would be a perfect complement to a Sell Side Advertising ad that is starting to take hold as a meme. Suddenly, as a publisher, I make money from all three transactions without the one-off transaction costs that plauge old notions of syndication. I happen to think this is a model that not only unlocks value, but discovers it. But Ross, you assume that anyone would pay for content when they can link to it. Not sure that's a valid assumption. What am I missing? Commercially viable remix use cases. For example, search and aggregation are limited to fair use cases today. Google scrapes and indexes an entire page, but only presents a link and summary on their own site. What business models could they come up with going beyond fair use? Or take more traditional media and their reliance on newswires as fodder. What if they could efficiently syndicate diverse content sourced online into print? Or from the initial publisher perspective, is there content you want to offer openly for non-commercial reuse, but also not restrict commercial use so long as you get paid? The laid-back atmosphere of the Googleplex might seem light years away from the dark-suited City of London. But Dresdner Kleinwort Wasserstein, the investment bank, is also a believer in the brave new world of wikis and blogs. “We recognised early on that these tools would allow us to collaborate more effectively than existing technologies,” says JP Rangaswami, chief information officer at DrKW. More than 450 DrKW employees have internal blogs and the bank has built an internal wiki with more than 2,000 pages which is used by a quarter of its workforce. After just six months, the traffic on the wiki exceeds that on the entire DrKW intranet. Mr Rangaswami says one of the most popular uses for the wiki is to create meeting agendas – a task fraught with political pitfalls: “Using wikis is much more participative and non-threatening, as people can see what other people have suggested,” he says. The wiki is also used with video clips to substitute traditional manuals in training new recruits. Emphasis mine, good sense JP's. I have an article in the spring 2006 issue of Sloan Management Review (SMR) on what I call Enterprise 2.0 -- the emerging use of Web 2.0 technologies like blogs and wikis (both perfect examples of network IT) within the Intranet. The article describes why I think this is an important and welcome development, the contents of the Enterprise 2.0 ‘toolkit,’ and the experiences to date of an early adopter. It also offers some guidelines to business leaders interested in building an Enterprise 2.0 inftrastructure within their companies. As described in the SMR article, these tools include powerful search, tags (the basis for the folksonomies at del.icio.us and flickr), and automatic RSS signals whenever new content appears. As I type these words I don’t know the best site to serve as the link behind the abbreviation ‘RSS’ in the previous sentence. To find this site, I’m going to type ‘RSS’ into Google and see what pops up (sure enough, the Wikipedia entry for ‘RSS’ was pretty high in Google’s results). I also don’t know the URL of the page I’m using right now to type this blog entry. I do know that it’s on my del.icio.us page, tagged as ‘APMblog,’ so I can find it whenever I want. And I don’t know what work my three collaborators on a research project are doing right now; I just know that when any of them has some results to share or a new draft of the paper they’ll post it on the project’s wiki (which is powered by Socialtext) and I’ll immediately get an RSS notification about it. These examples are not meant to show that my professional life is perfectly organized (that assertion would be worse than false; it would be fraudulent) or that we’ve addressed all the challenges associated with the growth of the Web. They’re meant instead to illustrate how technologists have done a brilliant job at three tasks: building platforms to let lots of users express themselves, letting the structure of these platforms emerge over time instead of imposing it up front, and helping users deal with the resulting flood of content. As the SMR article discusses, the important question for business leaders is how to import these three trends from the Internet to the Intranet -- how to harness Web 2.0 to create Enterprise 2.0. Andrew also dug deep to develop a Harvard Business School Case Study: Wikis at Dresdner Kleinwort Wasserstein. McAfee sounds a note of caution along these lines. He notes the possibility that "busy knowledge workers won't use the new technologies, despite training and prodding," and points to the fact that "most people who use the Internet today aren't bloggers, wikipedians or taggers. They don't help produce the platform - they just use it." There's the rub. Managers, professionals and other employees don't have much spare time, and the ones who have the most valuable business knowledge have the least spare time of all. (They're the ones already inundated with emails, instant messages, phone calls, and meeting requests.) Will they turn into avid bloggers and taggers and wiki-writers? It's not impossible, but it's a long way from a sure bet. This is true, adoption is the rub. But one hedge we have is, to McAfee's point, how these tools help cope with overload. I'd wager, in fact I have, that email volume will only increase, some devices only exacerbate the problem, and unlike KM -- more productive and simpler models have an upper hand. Would like to a FT article from today's Digital Business section to help prove this, but they got my company name wrong and a couple other errors (okay, I will). Dion Hinchcliffe focuses on the technical aspects of this trend: Ajax, SaaS and SoA. But what is really different is the focus on users ahead of buyers and architecture. Remember, it's made of people. This may be true of the experts of today but not the experts of tomorrow. I don't wish to sound complacent but I always end my presentations with the view that organisations don't have any choice but to get involved in this stuff as the teenagers of today are the workers of tomorrow and they won't accept anything less. If you don't help them they may not work for you at all or if they do they will start talking about your business out there on the web - they can't help themselves!